For the fourth year in a row, RVA Fashion Week will celebrate the fall season with a special series of events this weekend. Local non-profit Dress for Success and VCU’s student mag will also host fashion-related events. Throughout the weekend of shopping, partying, and walking, Richmonders will have the opportunity to get up close and personal with boutique owners, designers, and local influencers. Check out the rundown of events below and be on the lookout for a followup piece from RVA Mag next week. This year, the events kick off at Vagabond (700 E. Broad St.) with a private networking party for industry professionals, photographers, bloggers and sponsors. This night is usually filled with reconnecting, brief presentations from event sponsors. 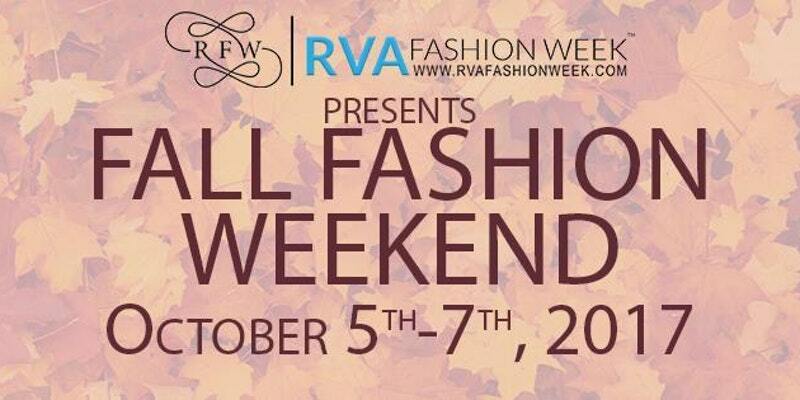 The kickoff of RVA Fall Fashion Weekend coincides with First Fridays held in the Arts District. Starting at Fresh Richmond at 5:30 p.m. (213 E. Broad Street), attendees can view designs by Aziz Blas from Midlothian. You’ll want to visit Fresh, which is a new event and art space owned and operated by local DJs Neil Flick (NeilNeil) and Andrea Marshall (DJ Lady Syren). They’re supporting artists in a number of new ways at this new venue. Belle Isle Moonshine will also serve up cocktails using the brand’s locally made moonshine. Participants are then invited to visit the newly opened Lou Stevens Glam Squad space, just four blocks west on Broad Street. The business specializes in bridal hair and makeup and if you’re one of the first 25 guests here after 7:30 p.m., the Lou Stevens staff will treat you to their lip and lash bar. An 8:15 p.m. fashion show will feature local consignment boutique Ashby and online boutiques Tailor and Trunk Up who both recently launched fall collections. Belle Isle Moonshine will also offer signature cocktails at this stop on the fashion crawl. Two non-profit events coincide with RVA Fall Fashion Weekend and are worth a visit before the evening’s ticketed runway show. Dress for Success is hosting a pop-up shop during the 2nd Street Festival from 10 a.m. to 3 p.m. at its boutique in Jackson Ward (210 E. Clay Street). Shop new, gently used, and vintage designer clothing and accessories to support the non-profit’s professional development and employment programs. Dress for Success is also the beneficiary of the evening’s formal wear runway show. River City Fashion Uprising, VCU’s student-run fashion publication, is hosting a clothing drive to collect gently used items and accessories for Born 2B Great, a local non-profit that provides academic support to local children through after-school tutoring. Born 2B Great funds its programs through the profits made at its boutique on Main Street, which relies on donations. The drive will be held 2-5 p.m. at 12 West Broad Street. Saturday evening is the main event. Fall Fashion Weekend attendees will get a taste for a true runway experience at the Observation Deck at Richmond City Hall. Guests must purchase tickets in advance, which range from $50 to $80 for front row seating. Arrive when the doors open at 6 p.m. to get a view of the city before the sun goes down. Before the show starts at 8 p.m., shop clothing, and accessories from local vendors including Miranda Classic Ties, Tailor, Trunk Up, Ichiakor Designs, Beauty Counter, Lonely Pine and more. Food and drinks are included with event tickets. Food will be catered by Vagabond and Mama J’s. Belle Isle Premium Moonshine will wet palettes again for this final night of Fall Fashion Weekend. The Weekend Formal Wear Runway Show will feature 11 local designers and boutiques: Travian Vann, STITCH. by Chanel Green, Salome Styles by Salome Autolino, toFREEyourSTYLE by Charissa George, Angelia’s Couture by Angela Cooper, Destiny Howard, House of LaPosh by India Watson, Amanda Welch, DNB by Destinee Nicole Browne, Kamala by Kamala Bhagat and 707. Kelli Lemon will host the Runway show featuring music from DJ MASS FX. Doors open at 6p, show starts at 8p. Tickets for the Runway Show are $50-$80 and can be purchased here.